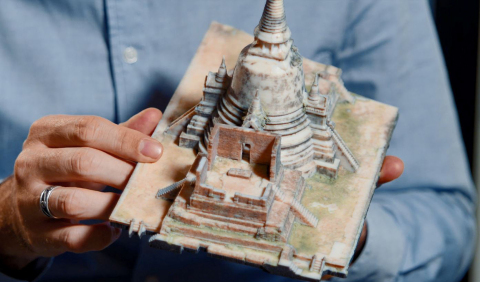 MINNEAPOLIS, MN, USA and REHOVOT, Israel, Feb 11, 2019 – Underscoring the power of realism in 3D printed models, Stratasys (Nasdaq: SSYS) and Google Arts and Culture are re-imagining some of the world’s most cherished artifacts and historical monuments through additive manufacturing. Backed by advanced color and multi-material functionality of the Stratasys J750 3D Printer, historians can now re-create these items digitally and physically – raising both awareness and accessibility of ancient history. The Stratasys J750 3D Printer offers some of the broadest colors ranges for the creation of highly realistic models. Leveraging more than a half million distinguishable colors and materials – from rigid to opaque, flexible to transparent – design teams can better align output with design objectives – all while streamlining iterations and advancing functionality of 3D printed models. One of the major initiatives for Google Arts and Culture is the restoration of rare plaster casts initially discovered by A.P. Maudslay during the late 1800s in Guatemala. For more than 100 years, these relics were housed across storage facilities in the British Museum. By leveraging 3D laser scanners to virtually re-assemble each, designers successfully reconstructed these items in physical form with Stratasys 3D printing – later allowing representations to be easily viewed by a wider audience online. Stratasys is a global leader in additive manufacturing or 3D printing technology and is the manufacturer of FDM® and PolyJet 3D Printers. The company’s technologies are used to create prototypes, manufacturing tools, and production parts for industries, including aerospace, automotive, healthcare, consumer products and education. For 30 years, Stratasys products have helped manufacturers reduce product-development time, cost, and time-to-market, as well as reduce or eliminate tooling costs and improve product quality. The Stratasys 3D printing ecosystem of solutions and expertise includes 3D printers, materials, software, expert services, and on-demand parts production. Online at: www.stratasys.com, http://blog.stratasys.com and LinkedIn.